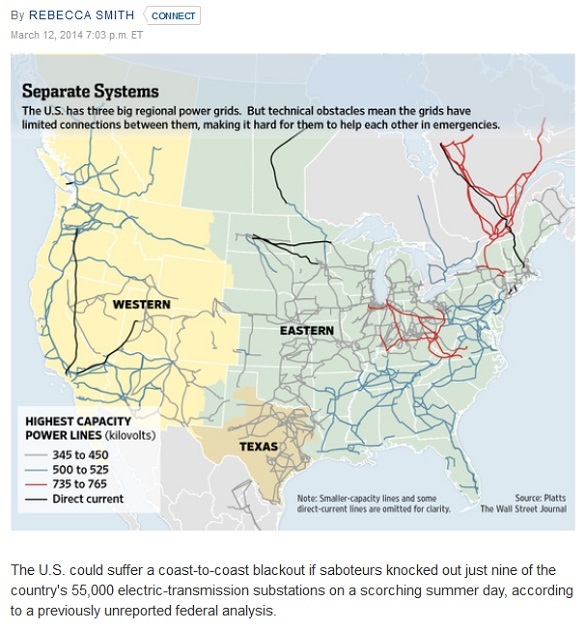 "The U.S. could suffer a coast-to-coast blackout if saboteurs knocked out just nine of the country's 55,000 electric-transmission substations on a scorching summer day, according to a previously unreported federal analysis," the Wall Street Journal's Rebecca Smith reported on the front page of Thursday's paper. A set of "coordinated attacks in each of the nations' three separate electric systems could cause the entire power network to collapse," Smith noted, citing "people familiar with the [Federal Energy Regulatory Commission] research." In its modeling, FERC studied what would happen if various combinations of substations were crippled in the three electrical systems that serve the contiguous U.S. The agency concluded the systems could go dark if as few as nine locations were knocked out: four in the East, three in the West and two in Texas, people with knowledge of the analysis said. In last April's attack at PG&E Corp.'s Metcalf substation, gunmen shot 17 large transformers over 19 minutes before fleeing in advance of police. The state grid operator was able to avoid any blackouts. The Metcalf substation sits near a freeway outside San Jose, Calif. Some experts worry that substations farther from cities could face longer attacks because of their distance from police. Many sites aren't staffed and are protected by little more than chain-link fences and cameras. "The power grid, built over many decades in a benign environment, now faces a range of threats it was never designed to survive," said Paul Stockton, a former assistant secretary of defense and president of risk-assessment firm Cloud Peak Analytics. "That's got to be the focus going forward."